United Technologies and Ducommun are good value stocks in the aerospace sector. A combination of multiyear backlogs at Boeing (NYSE:BA) and Airbus (NASDAQOTH:EADSY), and projections from industry bodies like the International Air Transport Association (IATA) for long-term passenger growth of 3.7%, make the aerospace sector very attractive for investors. I think large cap United Technologies Corporation (NYSE:UTX) and small cap Ducommun Incorporated (NYSE:DCO) are worthy investment candidates; here's why. First up, it's worth noting that United Technologies and Ducommun are both Boeing and Airbus suppliers, so the shifts in production patterns at both aircraft manufacturers have a profound effect on both companies' prospects -- a point I will return to later . Based on Boeing's planned deliveries of 760 to 765 aircraft deliveries in 2017, the company's backlog of 5,744 means it has roughly 7.5 years' worth of backlog on its books. Moreover, more passengers usually mean more miles flown and more aftermarket revenue -- all good news for aerospace companies. Or is it? 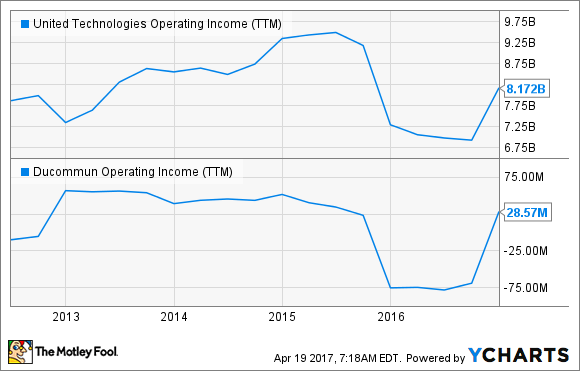 UTX Operating Income (TTM) data by YCharts. 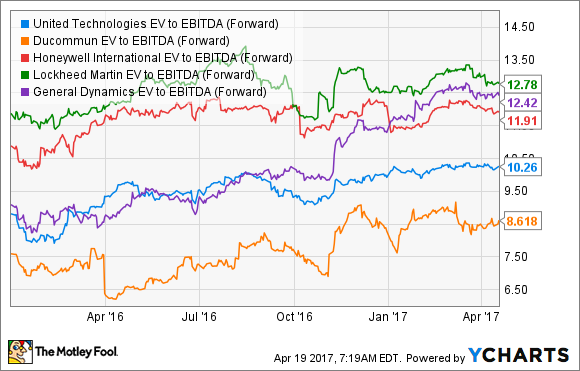 UTX EV to EBITDA (Forward) data by YCharts. United Technologies subsidiaries Pratt & Whitney and UTC Aerospace Systems together contributed 43% of overall company segmental operating profit in 2016, but profit growth was held back by two factors: a negative impact on margin due to the mix of commercial original-equipment (OE) sales, and the production ramp on Pratt & Whitney's new geared turbofan (GTF) engine -- an engine which has around 50% market share of Airbus A320neo engine sales. As aerospace systems shift from products on legacy aircraft (which tend to be higher-margin) to those on newer aircraft (which tend to be lower-margin initially) there will be a near-term drop in margin on commercial OE equipment sales. An Airbus A320neo powered by a Pratt & Whitney geared turbofan engine. Image source: United Technologies Corporation. Meanwhile, GTF cost per unit is expected to decline as production is ramped up from around 150 in 2016 to a range of 350 to 400 in 2017, and CFO Akhil Johri expects negative engine margin (losses taken on engine sales before aftermarket, maintenance, and service revenue kick in) to peak at $1 billion in 2018. Data source: United Technologies investor presentations. *UTC Aerospace Systems' commercial aftermarket includes military. Aerospace systems cost reductions will increase as the production of goods for newer aircraft increases. Aftermarket sales will grow due to establishing OE sales on aircraft. GTF production costs per unit will be reduced, and negative engine margin will be reduced. Around 80% of the GTFs are being sold under a fleet-care arrangement, thus ensuring long-term revenue for United Technologies. All told, once the company passes this period of transition, aerospace-related profits should grow strongly. Given that the stock trades at a discount to its peers, it looks like a good value. Investors looking for a small-cap option might like Ducommun. The company generates half of its revenue from structural systems, including such diverse items as cargo doors, winglets, tail cones, and exhaust ducts. The other half comes from electronic systems, such as cables and wiring, circuit-board solutions, and integrated electronic solutions. At the end of 2016, around 53% of Ducommun's backlog was in commercial aerospace, with 43% in military and space. However, it's the former that makes Ducommun exciting. Management expects long-term growth of 4% to 6% from its positions on aircraft such as the Boeing 737, 737 MAX, and 787 Dreamliner, and the Airbus A320, A320neo, A330, and A350, while military and space sales (Black Hawk helicopters, Tomahawk missiles) are expected to grow 0% to 2% in the long term. Ducommun makes winglets for aircraft. Image source: Getty Images. In late 2015, it closed an operation in Houston. In early 2016, management reduced the company's exposure to industrial end markets via the $38.5 million divestiture of an operation in Pittsburgh. The $14.6 million divestiture of its Miltec Corporation subsidiary reduced exposure to non-core military activities. The divestitures reduced revenue by $22 million in the fourth quarter, leading to a decline in overall revenue of $14 million. However, the cash from the divestitures helped reduce long-term debt from $240 million at the start of 2016 to $167 million at the end; management expects to pay down a further $25 million in debt in 2017. Ducommun is now a more streamlined company trading at an attractive valuation. Analysts expect flat earnings per share of $1.46 in 2017, with EPS growth of 37% in 2018. As the company invests in new facilities in order to prepare for growth, capital expenditures are expected to ramp up to a range of $22 million to $26 million in 2017, from $18.7 million in 2016; this will eat into free cash flow generation in 2017. No matter: Ducommun is positioning itself on a strong long-term growth path. As Airbus and Boeing ramp up production on the aircraft that Ducommun sells into, investors can expect earnings and cash flow growth for years to come. All told, United Technologies and Ducommun trade at attractive valuations; if you believe the aerospace industry is headed for long-term growth, then they are both worth buying. Both are facing some near-term headwinds that are holding back the headline numbers, but if you can look beyond this, they are both a good value.